Average rating 5 out of 5 from 372 reviews for Exploring Wales: Millennia under the gaze of mountains, according to AITO reviews. Day 1: Arrival at our hotel. Welcome drinks and dinner. 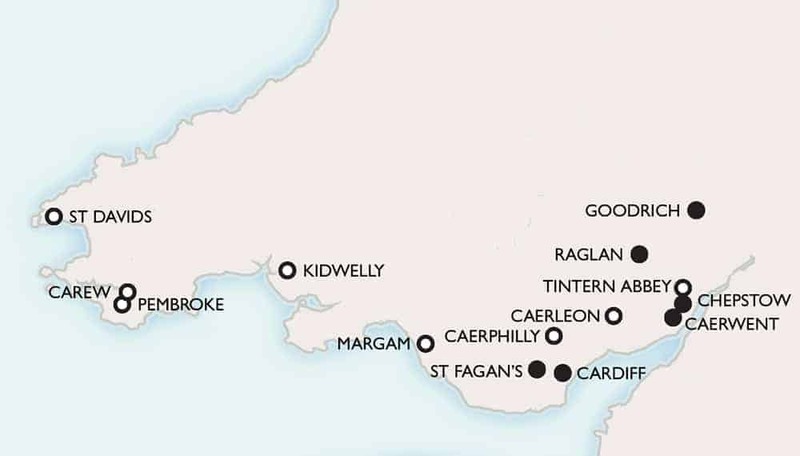 Day 2: We begin with the Roman impact in Gwent, the former territory of the Silurian tribe. At Caerwent, we visit their tribal capital under Rome. Roman houses, shops, a temple and government centre nestle amidst the houses of the modern village, surrounded by the substantial remains of the late Roman city wall. At nearby Caerleon we meet the other element of the Roman imprint – her military power. The long tour of duty of the Second Legion is revealed in a fine museum and the fortress’ barracks, amphitheatre and bath-house. We encounter new conquerors at Chepstow Castle, dramatically clinging to the bluff over the river, and have our introduction to some of the Marcher lords who wielded power from its great hall, down to the gunpowder era, when its ancient walls were breached by cannon during the turmoil of the Civil War. Day 3: In the morning, we cross the border for a visit to the Marcher castle of Goodrich, set in a dramatic rock-cut trough, its russet walls set against shrouding verdant greenery in the beautiful Wye valley. After, we return to the Welsh side of the Wye and one of Britain’s most beautiful monasteries, Tintern Abbey. We then pass on to the magnificence of Raglan castle. In the shadow of its soaring fantasy moated tower, we see the later medieval and Tudor story, as castles became fine country homes. Day 4: Into the Welsh capital, Cardiff, for a visit to her extraordinary castle and its multi-layered history! The visible remains begin with the latest of a series of Roman forts, extend through a Norman history complete with a daring kidnap-raid, to the late medieval hall – and then a remarkable second life and a lavishly opulent root-and-branch fairytale reshaping for the impossibly wealthy Marquess of Bute. Afterwards, we drive out of the city into the uplands to visit the colossal Caerphilly castle, a vast fortress with a concentric defence of lofty towers looming over great water barriers: the de Clares’ mightiest redoubt. Day 5: We visit the remarkable museum site at St Fagan’s, studded with transported or recreated buildings from the full sweep of Welsh history, set in the lovely grounds of a fine late Tudor manor house. Afterwards we visit the enigmatic inscribed stones at Margam before travelling on to formidable Kidwelly Castle, scene of the tragedy of Princess Gwellian and a desperate outpost during the revolt of Owain Glyndwr. Day 6: We begin at Carew Castle, the medieval home of Princess Nest, and marvel at the splendid transformation of the old fortifications into a fine Tudor residence. A short drive takes us on to a castle of an altogether different scale: Pembroke, the backbone of English power in Wales. A sprawling Marcher fortress filled with stories of Earl Strongbow and the de Clares, de Valences, Marshals and the first Tudors, birthplace of Henry VII and battleground of a Civil War siege. We then complete our extraordinary journey at St David’s. At Welsh Christianity’s most prestigious medieval pilgrimage centre, we visit the unique cathedral and the extensive and attractive remains of Bishop de Gower’s remarkable palace. Wonderful experience both in culture and experience. We had a wonderful break in the north of England learning Roman history amongst fabulous Roman remains of Hadrian's Wall surrounded by sweeping landscapes.The tour was well prepared and fun. The two tour leaders were a delight to be with and very informative - very experienced and knowledgeable. We loved this trip.